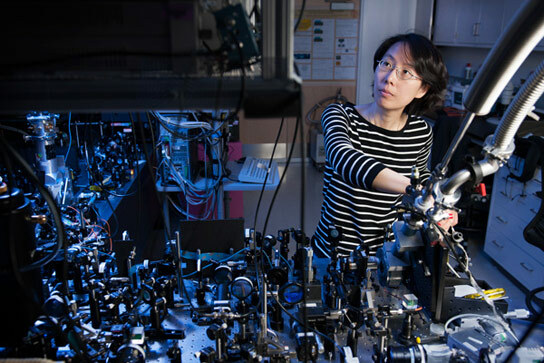 Physicist Na Young Kim, at the optical bench, is a member of the international team that has demonstrated a revolutionary electrically driven polariton laser that could significantly improve the efficiency of lasers. Making use of the unique physical properties of bosons, Stanford physicists have created an electrically driven polariton laser that uses less power than conventional lasers and could one day be used in many places from consumer goods to quantum computers. Lasers are an unseen backbone of modern society. They’re integral to technologies ranging from high-speed Internet services to Blu-ray players. The physics powering lasers, however, has remained relatively unchanged through 50 years of use. Now, an international research team led by Stanford’s Yoshihisa Yamamoto, a professor of electrical engineering and of applied physics, has demonstrated a revolutionary electrically driven polariton laser that could significantly improve the efficiency of lasers. The system makes use of the unique physical properties of bosons, subatomic particles that scientists have attempted to incorporate into lasers for decades. Electrically driven polariton lasers, Kim said, would operate using one-hundredth of the power of conventional lasers and could one day be used in many places from consumer goods to quantum computers. The work is detailed in the May 16 issue of Nature, and was conducted in collaboration with the National Institute of Informatics in Tokyo, Japan, and a team from the University of Würzburg in Germany, led by physicist Alfred Forchel. All lasers are based on Einstein’s principle of stimulated emission. Charged particles, such as electrons, exist in discontinuous energy levels like rungs on a ladder. An electron provided with enough energy can become excited and “jump” up to a higher energy level. Excited electrons can spontaneously fall down to an available lower energy level, shooting off the difference in energy as a bit of light called a photon. The amount of time that passes before an excited electron drops down and releases a photon is usually random. However, Einstein predicted that if an electron in an upper energy level was exposed to a photon with proper energy, the electron would instantly fall down and release a second photon identical to the first one. A laser keeps this process going by continually providing energy for electrons to move into higher energy levels. As more and more electrons are stimulated to release photons, the additional photons stimulate more and more electrons. Some of the photons are allowed to escape from the device to serve a purpose, such as reading data off a CD or etching a circuit board. The process, however, is inefficient. There is a hard limit to the number of electrons that can inhabit a given energy level at any given time, and conventional lasers waste energy unnecessarily exciting electrons to higher energy levels even when the lower levels are too full to accept the excited electrons when they fall. Kim’s polariton laser, however, pairs electrons with so-called “holes” to form another type of particle, an exciton. A hole is a gap where an electron could exist in a structure and is treated by physicists as a real, separate particle. This change drastically reduces the amount of power required to run the laser. The current iteration of the polariton laser requires two to five times less energy than a comparable conventional laser, but could require 100 times less energy in the future. “The outcome would look similar to that of the traditional photon lasers, but the physical mechanisms inside are very different,” Kim said. The laser consists of an electron reservoir and a hole reservoir. When a current is applied, electrons and holes come together to form excitons in excited energy levels. When a photon hits an exciton, it forms a polariton and emits an identical photon. The entire process is like a solar cell in reverse, Kim says. One benefit of the electrically driven polariton laser is it only needs to be attached to a power supply to emit photons, allowing it to be easily integrated with existing semiconductor chips in the future. The current polariton laser can run only at a chilly 4 degrees Kelvin (minus 452 degrees Fahrenheit) and requires constant cooling by liquid helium to prevent the excitons inside the gallium arsenide semiconductors from being pulled apart by thermal energy. The team hopes switching to a material that requires more energy to break apart excitons will allow them to build polariton lasers that work at room temperature, an important step toward widespread use. The polariton laser is already being utilized by Stanford researchers developing quantum computers and quantum simulators. Kim believes similar lasers will be available to those outside the scientific community within the next five to 10 years. The research was supported by the National Science Foundation, the DARPA QUEST program, the Japan Society for the Promotion of Science through its “Funding Program for World-Leading Innovation R&D on Science and Technology (FIRST Program) and the State of Bavaria. Be the first to comment on "Stanford Physicists Develop an Electrically Driven Polariton Laser"